Here's a picture of my 1976 Moto-Guzzi V1000 Convert. It's a 950cc twin with a 2-speed transmission and a torque converter, which works like an automatic transmission on a car, but with the ability to switch between high and low gearing. I'll explain a little about the bike, and I'll list the modifications I've done in case you have an old Guzzi and want to improve it. What's it like to ride? Kind of like a 600-pound scooter. All you need to operate the bike is your right hand. Power is always going to the rear wheel, as in an automatic car, and there is no neutral. It does have a clutch, which can be pulled in to stop power from going to the wheel. Thus, when you start it up, the rear wheel rises up like a low-rider car. The bike has linked brakes on the foot pedal, so when you step on the pedal it operates the back disk and one of the front disks, and the bike kind of sits down and stops. The handlebar lever operates the other disk on the front wheel. It can stop quickly, but requires a really firm squeeze on the lever and stomp on the pedal. The bike makes 70 horsepower at the crank and 50 at the rear wheel because of the torque converter. Handling is really good for such a heavy bike. Mine has Koni shocks on the back. I think they are original equipment, but I'm not sure. They're pretty firm for normal commuting use, but the big soft police seat on my bike makes it a comfortable ride anyway. On a twisty road it corners a lot faster than you would expect it to. Period road tests I've read about the bike confirm this. Guzzis are good handlers. It goes pretty good in low gear. The front fork has automatic transmission fluid in it as a lubricant and non-adjustable damping rods providing the damping. This is too bad in my case, because the damping rods are failing, and the only way to increase the damping would be to buy new ones $$$$$$!. Whereas on a traditional oil-damped fork like on my Suzuki I could just buy heavier oil. I may try shimming up the springs and see if that helps a little. My bike has about 55,000 miles on it as I write this, and it had a tendency to jump out of high gear into low at inopportune moments. If I gave it a lot of throttle on the freeway, it would make a frightening grinding sound, then jump into low gear and try to throw me over the handlebars at 70 MPH. I fixed this by removing the gearshift lever and putting in a plate locking it into top gear. Here's a link to a page with a picture of the linking plate. The user's manual says it doesn't hurt the bike to keep it in top gear all the time. It just makes it a little slower to get going from a stop. Moto-Guzzi people I've talked to seem to think it won't hurt anything to do this. I changed the transmission oil after 1,000 miles of riding like this, and there weren't any chunks in it. I suspect it's a problem with the detent mechanism in the transmission, but it will be years before I have time to take it apart. I have an extra automatic transmission in a box in my garage, which I got on eBay for $110. Someday I'll get around to installing it. Maintenance on the bike requires adjusting the valves every 5,000 miles, though mine stay in adjustment pretty well, and keeping the points adjusted properly. And you have to change and check levels of automatic transmission fluid in the torque converter, oil in the crankcase, oil in the gearbox, oil in the rear hub for the shaft drive, and brake fluid. When I took it on a trip to the mountains I had one saddlebag full of camping stuff and the other one full of oil and tools. On a long trip it cruises nicely at 75 mph. A big windshield would help make it more comfortable. When I rode up to the Sierras the highway part of the journey was easy. I got 45 miles per gallon on the highway. Around town I get closer to 30. The gas tank holds about 7 gallons, so it has good range. In American national parks, the fee to camp in most campgrounds in the park at the time was $15 per day, but all parks have cheaper campgrounds that are harder to get to and have less services and no running water for $5 a day. As I didn't have a job at the time and was saving money, I decided to camp at one of the cheaper places. It was at the end of a long one-lane rocky, sandy road. That was when I really realized the difference between street bikes and dirt bikes. Because of the linked braking, I couldn't use the rear brake exclusively, so it was harder to control. And I needed a firm foot on the brake pedal when I was stopped, or the rear wheel would keep turning and dig a hole in the sand. I got where I was going without falling down, but wouldn't recommend it for off-road use. 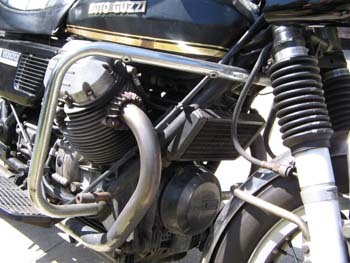 If you're looking for expert advice on the Convert or other Guzzis, check out www.wildguzzi.com. There are lots of people a lot smarter than me with decades of experience working on old Guzzis. Here are some of the things I've done to the bike. The fork gaiters are stock BMW parts, which I bought from a BMW dealer. They look great and fit pretty good. I used automotive hose clamps to attach them. They're very think and durable, much more so than the ones I see for dirt bikes. Automatic timing chain tensioner. The stock timing chain tensioner on Moto-Guzzis of this era, including the T3 models is a plastic block. You have to remove the front engine cover, which is a pain, loosen up the mounting bolts, slide it over to get the proper tension, then torque it down. This must be done regularly. On the automatic model, the transmission fluid pump is under the cover, so you must drain the transmission fluid from the tank and lines before removing the cover. There are a couple of timing chain adjusters on the market. I bought mine from Moe's Cycle Garden. It's a plastic bumper with a spring on it to place constant tension on the chain. It made a big difference on how my engine ran. Before installing it, it ran rough and the timing mark jumped around so much that I couldn't accurately set the timing. After installing it, the mark stayed where I put it and it started and ran much smoother. And I never have to go in there and adjust anything again. Cafe fairing. After putting the cafe fairing on my bike, I realize that it looks kind of wrong with the giant handlebars, but I'm going to leave it on for a while. It does a good job of covering the gigantic ugly instrument pod. It was $49.99 from Cycle Gear. It comes with 2 metal L brackets that have to be beaten and bent into submission to fit on the bike, but once you get the right bend, it stays where you put it. I've put these fairings on a couple of bikes, and I like them. In one instance I went over the handlebars and shattered the fairing with my knees without hurting myself. This is a really important consideration, as a lot of the more expensive fairings and windshields I've seen on bikes are very thick and sturdy and look like they could cut a person in half. Someone just told me they couldn't find it on the Cycle Gear website. I looked and couldn't find it there either. Their UPC number for it is 002433, and part number is BA21-00018. I also found it at www.jcwhitney.com for $59.99 with the item number ZX029585R. Rear rack. 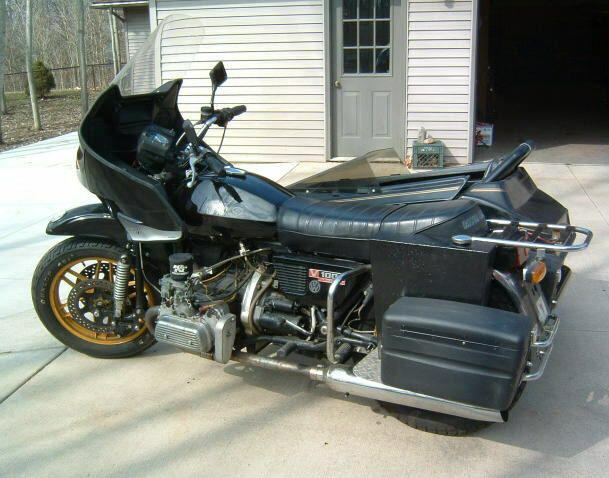 I bought a rear rack and luggage box (not on the bike anymore) from Moto-Guzzi Classics. They're great guys to buy parts from. I get most of my parts from them. Rear tire. The rear tire is a 120/80, and it clears the driveshaft and fender just fine. Stock tire on the bike was a 110/90. Less-restrictive mufflers. They are a little louder than stock, but not annoyingly so. They were installed by the previous owner. Stamped in the muffler is "Lu Hao Silencers LTD." They look pretty generic and you can buy them from the JC Whitney Catalog. The bike sounds like a lawnmower at low speeds and makes a nice Italian roar when I really rev it up. Carburetor jetting. It has been running great for 10 years with #145 main jets (Stock size is #130), and the needles raised one notch. Pilot Jets are stock size, #50. 72-month car battery. The battery is 7 or 8 years old now. Putting a high-amp battery hasn't hurt the bike at all, and the only electrical parts I've replaced on it are the ignition coils when one of them went bad. Volkswagen ignition coils. Somebody told me I could use Volkswagen ignition coils, so I tried it when mine went bad, as they were a lot cheaper than motorcycle coils and they fit under the tank. I DON'T RECOMMEND DOING THIS. The bike ran fine at low RPMs, even seemed to run better than it did with motorcycle coils, but it was much less willing to rev quickly. I removed them and bought some generic motorcycle coils from JC Whitney, which were under $20 each and have worked great for 8 years. Some maniacs remove the Guzzi engine and replace it with a Volkswagen unit. I'm not sure how the transmission holds up to all the extra power over time, but it's an interesting conversation piece. Here's a picture of one.